Every teenager thinks their parents are evil. What if you found out they actually were? Marvel's Runaways is the story of six diverse teenagers who can barely stand each other but who must unite against a common foe – their parents. "The Muppets" return to prime time with a contemporary, documentary-style show that, for the first time ever, will explore the Muppets' personal lives and relationships, both at home and at work, as well as romances, break-ups, achievements, disappointments, wants and desires; a more adult Muppet show, for kids of all ages. Season 1, Episode 16 - "Because... Love"
Kermit asks musician Jack White for advice when he and Miss Piggy take another look at their relationship after she gets out of the hospital. Season 1, Episode 15 - "Generally Inhospitable"
After her stint in the hospital, Miss Piggy and Kermit reevaluate their relationship, and Kermit turns to Jack White (The White Stripes) for advice. Season 1, Episode 14 - "Little Green Lie"
Kermit and Miss Piggy pretend to be a couple again for Robin's benefit. Meanwhile, Gonzo spends all his free time with Camilla, so Pepe and Rizzo look for a new pal. Season 1, Episode 13 - "Got Silk?" Season 1, Episode 12 - "A Tail Of Two Piggies"
Season 1, Episode 11 - "Swine Song"
Season 1, Episode 10 - "Single All the Way"
The gang is preparing for the annual "Up Late" live Christmas special with, special guest Mindy Kaling. Animal is in charge of tinsel, Sweetums hangs the lights, Sam Eagle strategically places the mistletoe - everything is in order. Or so it seems. Meanwhile, Miss Piggy offers relationship advice to Fozzie, which forces her to reevaluate her relationship with Kermit. Yolanda rigs the Secret Santa gift exchange, and Echosmith performs at the crew's Christmas party. Season 1, Episode 9 - "Going, Going, Gonzo"
"Going, Going, Gonzo"- After a show-stopping duet with Miss Piggy on "Up Late with Miss Piggy," Joseph Gordon-Levitt joins Scooter, Pepe and the gang for poker night; The Great Gonzo gears up to perform his dream stunt; and Dave Grohl challenges Animal to a drum-off. Season 1, Episode 8 - "Too Hot to Handler"
Scooter books his long time TV crush, Chelsea Handler, who really heats things up both on 'Up Late' and in Scooter's personal life. Meanwhile, Fozzie wants to take it to the next level with Becky but when Kermit and Denise go on a double date with them, Kermit discovers that Becky might have a few skeletons in her closet. Season 1, Episode 7 - "Pig's in a Blackout"
Season 1, Episode 6 - "The Ex-Factor"
Kermit is scrambling to find the perfect birthday gift for Denise, so he turns to Miss Piggy for help. Meanwhile, guest Kristin Chenoweth agrees to do a gig with The Electric Mayhem and inadvertently causes a rift between the band. Season 1, Episode 5 - "Walk the Swine"
Season 1, Episode 4 - "Pig Out"
Season 1, Episode 3 - "Bear Left Then Bear Write"
Season 1, Episode 2 - "Hostile Makeover"
In an attempt to make Miss Piggy happy, Kermit sets her up with Josh Groban who fills her head with ideas on how to make Up Late with Miss Piggy better. Meanwhile, Fozzie is invited to a party at Jay Leno's house and everyone is annoyed that Bobo is selling cookies for his daughter's troop. 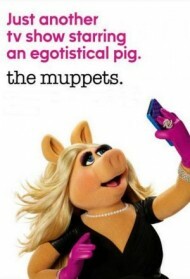 Season 1, Episode 1 - "Pig Girls Don't Cry"
Miss Piggy is angry when Kermit books Elizabeth Banks as a guest on "Up Late With Miss Piggy"; Fozzie Bear gets acquainted with his girlfriend's parents; Imagine Dragons perform.